Henry and Ida have welcomed three new hatchlings into their Apatosaurus family. Buck is wild, Libby is mischievous, and Arlos is very, very timid. Henry and Ida have built a silo to keep other animals from eating their corn. They have each placed their footprint on the silo. Their children want to do so as well, but they are stopped. Henry and Ida say that they each have to prove themselves before they can leave their mark. Buck and Libby succeed quickly, but Arlo’s timidity keep him from earning a mark on the wall. He is dejected. 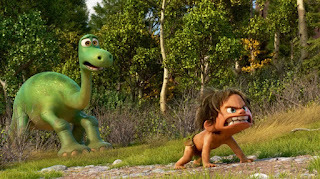 Henry tries to create a successful situation for Arlo, and together they set off to track down the animal that has been eating their food. Arlo experiences loss on this journey, and then must work to process his loss, establish his identity, and make his mark. While Arlo and his father are out on the quest to earn Arlo’s mark, Arlo’s father is killed by a torrential wave. Arlo eventually ends up journeying, alone, with his only friend being the boy who he blames for his father’s death. He must avoid unscrupulous strangers who mean him harm in order to make it back to his family. Near the end of his journey, Arlo sends the boy, Spot, to go be with other humans; he implies that family means being with your own kind. They tearfully separate. Before sending Spot to live with other humans, Arlo starts to lead Spot away from them, promising Spot food and a bed, and a place on the farm. Both Arlo and Spot have lost family members. They powerfully symbolize what they’ve experienced by creating an artistic definition of family, and then howling their grief. It is a powerful scene, and a pretty accurate representation of a healthy way to acknowledge loss and mourn. 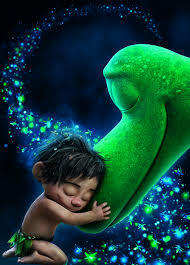 The film seems to imply that family is only determined by genetics; even though Arlo and Spot have been through much together, Arlo sends Spot to live with other humans with whom Spot does not have a relationship because they’re humans. Arlo has been traumatized by seeing his father’s death, and he is bothered by intrusive visions of it. My wife, a psychologist, noted that this is a pretty accurate portrayal of PTSD. In a way, Arlo’s dad did die because Arlo hadn’t earned his mark. Also, it’s very easy to imagine Arlo feeling excluded by being the only family member not allowed to add their mark to the family silo, and kids who’ve been adopted might be particularly sensitive to feeling excluded, or themes of conditional love. 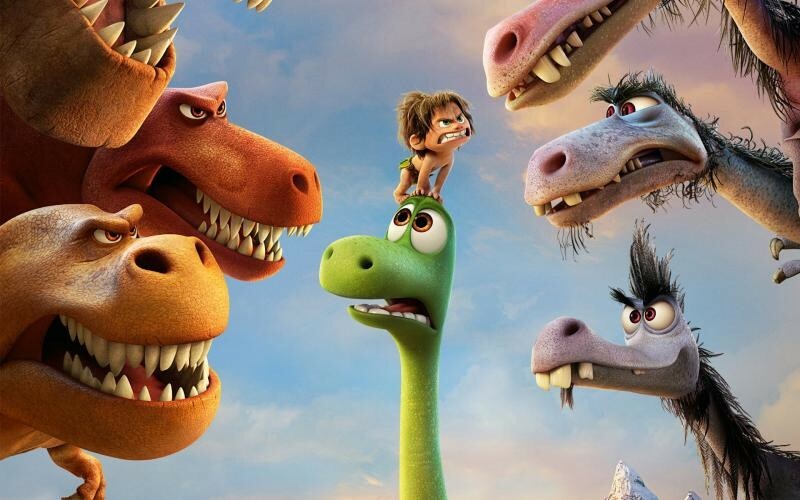 Arlo seems to take responsibility for his family’s survival. He promises his mother that he won’t let the family starve. 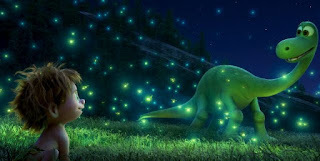 Arlo becomes lost, separated from his home and his family. His feelings of fear might be familiar, but also might be troubling, to kids who’ve been in foster care. One macho character recounts his acts of bravery; one story is a bit gruesome as he boasts of a time when he defeated a crocodile, “I drowned that croc in my own blood.” It’s exaggerated for humorous effect, but some kids might take it literally and be bothered by it. Arlo’s brother calls him a coward, and it’s obvious that this cuts Arlo to the heart. Some animals are eaten on screen by others; one insect’s head is ripped off. Arlo’s life is threatened a couple times, as is the life of Spot. The Good Dinosaur shows a young character experiencing, mourning, and recovering from loss. It shows the place of fear much as Inside Out showed the place of sadness. Elements of separation from family might make the film too sad for kids who remember being separated from loved ones, or for kids who have been in foster care. The film is emotionally intelligent, though, and captures grief and PTSD pretty well. If kids aren’t triggered by what they see, this film could provide a good opportunity for parents to talk about some powerful emotions regarding loss and fear. 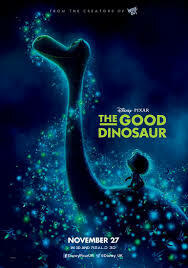 The scene of Arlo’s father dying might make this one better suited to kids 10 and up, with parents present. Who is in your family circle? Were Spot and Arlo family, or only friends? How can you tell?